The Congress returned to power in Haryana today with a more than two-third majority, while the BJP-JD (U) alliance was involved in a neck-and-neck race with Congress-JMM formation in Jharkhand but Bihar was wide open, with Ramvilas Paswan's LJP emerging as kingmaker in a fractious verdict. Union Railway Minister Laloo Prasad Yadav presented a populist Budget for 2005-06 envisaging no hike in passenger fares or freight and parcel rates coupled with introduction of 46 new trains. 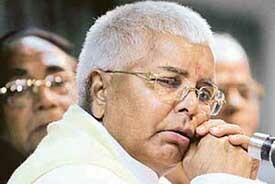 Railway Minister Laloo Prasad in the Lok Sabha on Saturday. Will the economy be able to achieve the targeted 6.9 per cent GDP? The BJP is likely to table a privilege motion against Prime Minister Manmohan Singh for the alleged leak of the Union Budget through his reply to UPA Chairperson Sonia Gandhi on better amenities to the weaker sections in the coming Budget. Protests by NDA members and the election campaign did not derail the ‘Laloo Express’ from chugging relentlessly for about two hours as he presented the Railway Budget in the Lok Sabha today. For the north-western region comprising the states of Punjab, Haryana, Himachal and Jammu & Kashmir the budget has been a mixed one. "The riots in Gujarat were a black spot for us in the sense that during the six-year rule of the Vajpayee government, the communal situation had been good". — L.K. Advani former Deputy Prime Minister said at the India Today Conclave. The Opposition parties today described as “disappointing” and “status quoist” the Railway Budget for 2005-06 presented today, while Left parties expressed happiness over no hike in passenger fare. One person was killed and three others were injured in a train dacoity near here this morning. Six or seven armed robbers entered the last coach of the Jalandhar-New Delhi superfast train (4682) between Doraha and Jaspalon. Water cannon failed to dampen the spirits as Punjab’s former Chief Minister Parkash Singh Badal, 34 MLAs and party supporters raised slogans against the “murder of democracy” during the Ajnala byelection before being taken into custody by the Chandigarh police. 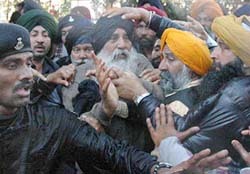 SAD President Parkash Singh Badal trying to regain his composure after being hit by a water cannon in Chandigarh on Saturday. Inmates, including a convict, of the District Jail at Nayagaon in Bhondsi, near here, clashed today in which eight of them were injured. The development is a sad reflection of the administration of the jail. This is not the first time that a clash between the inmates has taken place. Lying low for all these years, the Haryana IAS Officers Association found its voice today — one day before the counting of the votes for the Assembly elections in the state.